The San Diego State University Press Blog | For over 50 years, the West Coast’s most eclectic academic press. For over 50 years, the West Coast’s most eclectic academic press. Humor & Eroticism in Advertising, by Maria Cristina da Silva Martins, explores the role that seduction plays in advertising. Through close analysis of Brazilian magazine ads published in the 1980’s, Martins uncovers the aesthetic, political, and cultural exchanges that occur in modern advertisements. SDSU Press Brings Ana Castillo to San Diego State University With a Host of Other Cool Co-Sponsors! 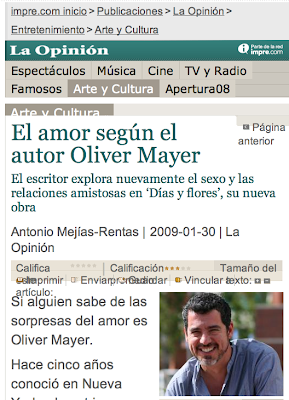 Click the image above to get the whole smashing review of Oliver Mayer’s new play, Dias y flores. You can get a copy of The Hurt Business, a work wholly focused on the writing of Oliver Mayer, right here! Or hit the Amazon logo, opposite! The author’s Distinguished Graduate Research Lecture addresses the implications of repeated live performances for establishing a play’s definitive text. Physician, author, stage producer, and director, Miller has produced twelve plays in the acclaimed BBC Shakespeare Series, directed six of them, and has directed at least a dozen opera productions for the English National and Frank furt Opera Companies. This book responds to a growing demand for practical devices which will enable disabled persons to participate in a full range of individual recreational services. In a scholarly and sympathetic study enhanced by over 100 illustrations, art historian Ida Rigby analyzes attempts by German Expressionist artists to integrate art into the movement for social reform in the wake of Germany’s bitter defeat in World War I and during the ensuing revolution.